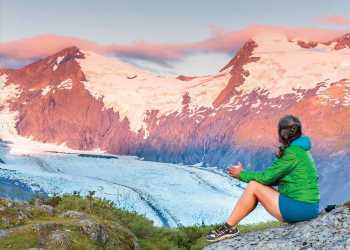 Perfect for history buffs and culture lovers, this trip transports you through thousands of years of Alaska history. Witness evidence of the 1964 Good Friday earthquake, hear the tales of Alaska pioneers, examine the Russian influence on Alaska Native culture and check out vintage aircraft. On March 27, 1964, the most powerful earthquake ever recorded in North America shook all of Southcentral Alaska. See the evidence first hand at Earthquake Park, just outside downtown Anchorage, where huge tracts of land slid into Cook Inlet. The park features an interpretive display and offers stunning views of the city skyline and Denali. For just a few bucks, bike rentals from downtown can get you there in a breeze. Stop by the Alaska Public Lands Information Center to explore Alaska’s public lands through wildlife and cultural exhibits, interactive videos and trip-planning information. Park rangers lead the free Captain Cook walking tour at 11 am and 2:30 pm. (summer). Across the street, directly behind the Log Cabin Visitor Information Center is Historic City Hall - this two-story building opened in 1936 and once housed all of the city’s municipal services. Today, find a free exhibit of early Anchorage in the lobby. Check out the Bear Square to hear tales from the Iditarod Trail and relive the serum run to Nome during the 1925 diphtheria epidemic, when 20 hardy mushers and their dogs persevered through the harshest conditions to save untold lives in Nome. Hook into a king salmon or step aboard a hot air balloon for a simulated drift over Prince William Sound. Drive north to Eklutna Historical Park, a Dena&apos;ina Athabascan community dating back to 1650. The park examines the fascinating mixture of the Russian influences and Athabascan culture. Be sure to check out the Saint Nicholas Russian Orthodox Church, the oldest building in the greater Anchorage area, and the cemetery with colorful spirit houses. The visitor center has a gift shop and offers guided tours. See the northern lights during summer! Alaska Naturally presents “AurorA: Alaska’s Great Northern Lights,” a stunning digital presentation set to incredible original music scores. 9 a.m. - 9 p.m. at the Alaska Center for the Performing Arts.